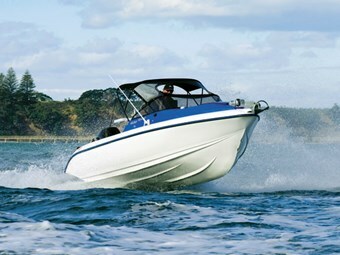 Mac boats are built tough without compromising on looks. We gave the Mac Daddy of the Mac fleet – the 600 Sport – a thorough work-out in testing conditions. 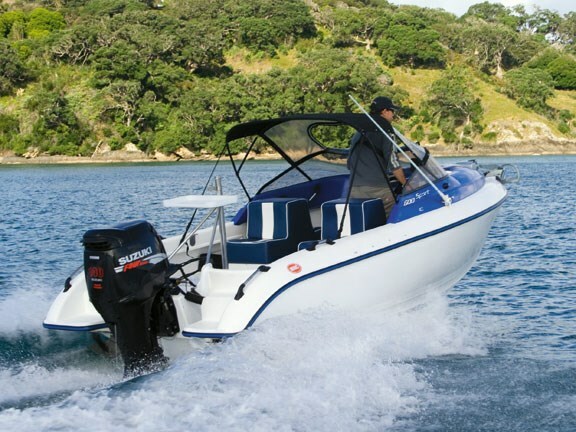 Mac boats are manufactured in East Tamaki by Galloway International. Led by managing director Garth Galloway, it produces a range of models from 2.1m to 5.75m in overall length. 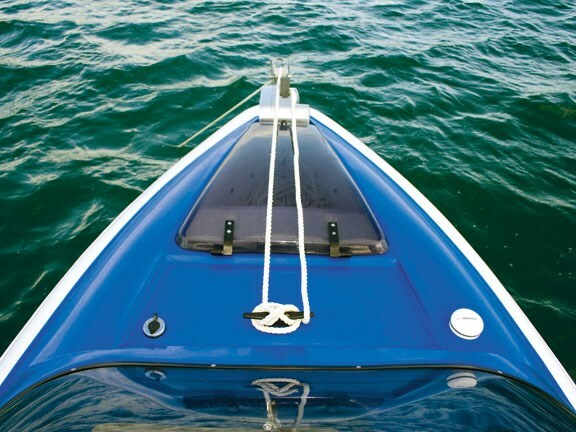 All Mac boats are built from marine grade polyethylene to CE, US Coastguard and MSA survey standards. Polyethylene is positively buoyant (unlike aluminium or fibreglass) and lightweight, and when manufactured into a "double walled" one-piece hull it’s very strong. Polyethylene needs no painting and absorbs most knocks, reducing maintenance costs. The positively buoyant polyethylene and the closed-cell polyurethane foam used in the internal cavities of the hull provide plenty of flotation. A thorough inspection prior to departing the boat ramp found the finish quality of the polyethylene to be of a high standard – if not quite as glossy as a paint job. There is only one weld in the entire hull construction, between the cabin top and the hull, and it’s a very tidy one. There are no sharp edges in sight and the profile of the boat is quite sporty. Mac Boat’s offers a wide range of customisation and the test boat is up the upper end of the spectrum. It was good to see a quality anchoring package bolted to the bow. 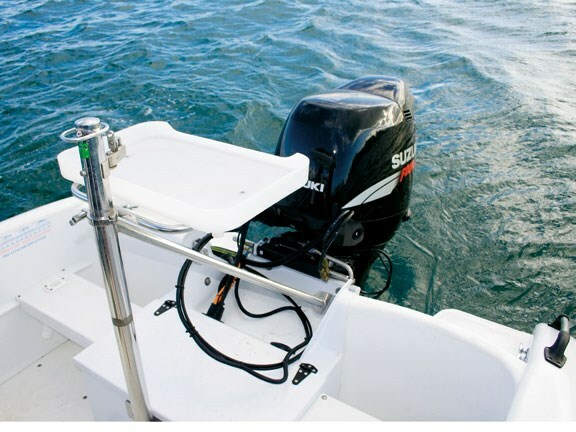 A solid fairlead feeds a quick freefall windlass, which fits nicely into the space available. 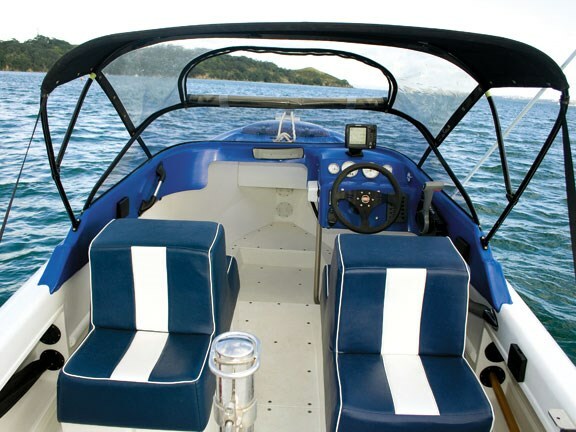 Access is via a large front hatch and there is a second cleat in front of the windscreen as a back-up that can be accessed from the helm station. Up front there is a large storage area with a self-draining recess in which to stow gear securely. A stainless steel grab rail is also provided for a little extra leverage. The dash has a practical layout, with Suzuki gauges in place for monitoring fuel use, RPM, speed through the water, and trim. 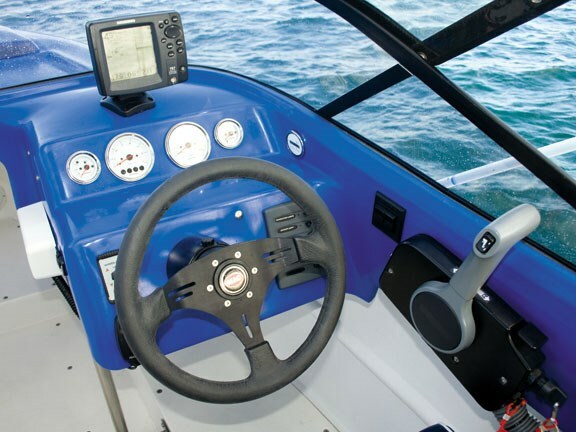 The switches are neatly positioned on either side of the steering wheel with the VHF tucked underneath in easy reach. Trim tabs aren’t usually required on inherently stable pontoon boats, but this Mac 600 has them anyway. The back-to-back seating is comfortable and provides plenty of dry under-seat storage but is non-adjustable. At just a shade over six foot I felt cramped seated at the helm, with my knees touching the dash. This was further exaggerated by a combination of the low bimini top and the windscreen surround being right at eye level, which obscured my vision somewhat when seated. I felt more comfortable driving standing up. The team at Galloway have acknowledged this issue and are taking steps to rectify it. Optional side pockets provide excellent rod storage and the two rear seats feature a couple of rod holders as well. Under-floor storage is also built into the hull and looks big enough to take a couple of scuba tanks on each side. The battery, fuel primer and bilge pump are hidden away inside a lift-up box located between the rear seats. A solid stainless steel ski-pole that doubles as a bait board holder is a good addition in terms of versatility. The polyethylene floor has a non-skid pattern moulded into it. It’s easy to clean but can get slippery when wet. Carpet or tube-floor matting can be supplied. Once clear of the five-knot markers, and with a calm patch of water ahead, I put the hammer down to see what she could do and topped out at 40mph riding solo. As I approached the channel and became exposed to weather I was forced to ease back to 3500rpm and a comfortable cruising speed of 20mph. A sharp metre-high chop forced a further easing of the throttle to around 15mph to avoid getting airborne – not that the boat cared either way. This test boat has been set-up for bare-foot skiing and is deliberately overpowered in order to provide better hole shot performance. The fact that it can handle the extra power and weight is testament to the strength of these hulls. The downside is that it is slightly backside-heavy and falls off the plane under 15mph. This comment should be treated in the context of the observation and the same boat set-up according to the specifications would not suffer the same problem. It should also be noted that no-one would be waterskiing on a day like this anyway. Over-powered or not, this Mac 600 Sport took all the inclement weather and our test driver’s heavy foot and just laughed. The landings were soft, and due to the sound absorbing properties of the polyethylene and the polyurethane foam, whisper quiet. Couple that with the smooth, quiet Suzuki four-stroke and you have a peaceful boating experience – well, about as peaceful as you can get in a power boat. As far as stability goes this boat was rock solid with very little movement at rest our underway. 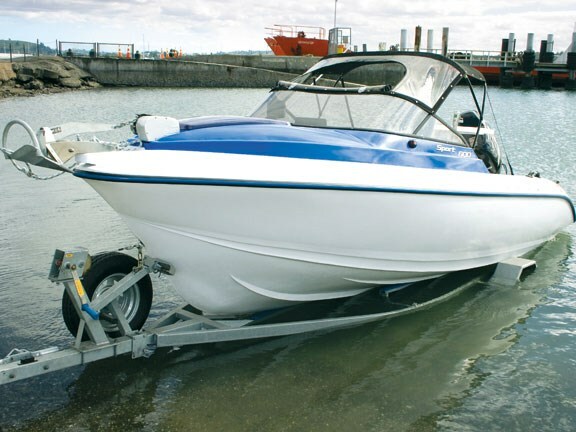 Mac boats are supplied on a purpose-built single-axle trailer with polyethylene skids. While this is much lower maintenance than a typical roller set-up, it did take quite a bit of effort to push her off. Further effort was required at retrieval time due to the single-handed winch set-up, but the skids guided the boat on perfectly. Being lightweight this rig was a breeze to tow with a modest family wagon. If you’re looking for low maintenance, low cost and low hassle boating, without having to compromise on looks, then one of these might be just the ticket. Ask anyone that has had a Mac boat and they’ll tell you just how tough, safe and stable they are. Coastguard obviously agrees as it uses Mac boats as its training vessels. See Mac boats for sale.